What's your favorite gaming moment of the past year? Flying Battlefront's Falcon? Uncharted 4's car chase? 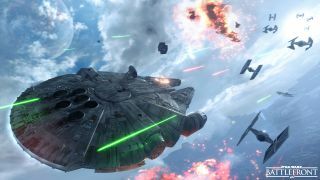 The first time you flew the Millennium Falcon in Star Wars Battlefront; getting the play of the game in Overwatch; Uncharted 4's car chase. It's been a great year for gaming moments. But which is the absolute best? It's a tough question - and you're needed to help answer it. The Golden Joystick Awards 2016 are just around the corner and, being the only video game awards where the winners are picked entirely by the gamers, your vote really does count! It's not just best gaming moments that are being decided either, but everything from best gaming platform to the most wanted unreleased games. You've got until October 31 to cast your vote here. It's the 34th year the prestigious awards have been on, with last year's big winner being The Witcher 3. So what are you waiting for? Have your say and make gaming history.